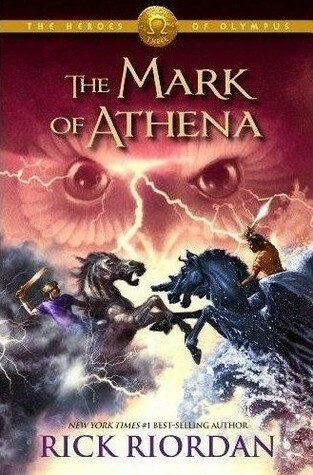 The Mark of Athena is the third installment of the Heroes of Olympus series. The Seven demigods travel to Rome to find and release Nico. Annabeth has her own quest to follow the Mark of Athena. They met countless of challenges, monsters and creatures of myths brought back by Gaea and the open Doors of Death. It was interesting to learn and get to know more Greek and Roman myths. They fight a new bunch of monsters and Mark of Athena is not lacking in the actions department. But I feel like parts could have been taken out- expeditions were made longer because at each and every step, something went wrong and they're attacked by monsters/evil gods. It made the book unnecessarily long. One of the most anticipated scenes in Mark of Athena was the meeting between the Greek and Roman camps (but mostly just Annabeth and Percy's reunion). My heart just went out to those love birds. They really do love each other. But I was a little cross that the reunion was cut so short. We needed more quality time! Oh, and the tension. It was intense. They didn't come out and say it, but you could tell that everyone was uncomfortable with everyone. The air was electrified and sparks were flying (literally). It was very interesting to read from Annabeth's perspective for the first time. She's basically the only other character that we've really known since PJ and the Olympians. I admit, I wasn't really fond of Annabeth, especially towards the end of the Percy Jackson's series so I fully expected to hate reading in her perspective on this one. And I did, but not for long. I started liking her again. I just felt like I understood her more. Turned out we share quite a few opinions and values. There were three other narrators, along with Annabeth- Leo, Piper and Percy. Riordan did a really good job with character development, especially with the narrators. Their weaknesses and doubts were explored and it just showed that these Seven might be demigods, but they're still human. They're still teenagers. I felt really bad for Leo. He was the outsider. Everyone else literally coupled up and he's just there on the background, being a mechanic. And he's supposed to be 16 years old, right? Yeah, well, I can't see him that old. The way he acts and talks makes him sound like a kid trying too hard to be cool and funny. Percy's point of view was the best. He's grown so much. He was a cheeky, playful kid in PJ and the Olympians but he grew up in Mark of Athena. He's not invisible anymore. He was humble, made mistakes and became mature. There were some great character development. I'm so proud of him. My only complaint is that he's not as funny as he was in PJ and the Olympians. I guess his humour came through his first person narrative. Piper, though, was useless. She was useless as a narrator, she was useless as a demigod. The other demigods weren't really focused on. They were ultimately just a side show to ther four narrators. They weren't developed, though I assume they'll get the narrator roles in books later on in the series. But Frank, oh Frank, how I despise you but I still felt bad when it seemed like Riordan was hell-bent on making you look like a bumbling, clumsy baffoon every chance he could get. It ended on a real cliffhanger and there's so many unknowns about the next book that it's anyone's bet on what would happen. But, I didn't really feel that rush of excitement when I finished it. Nothing like that tingling feeling, the desire to read the next book, I had for The Lost Hero and Son of Neptune. Nevertheless, that isn't going to stop me from theorizing until next year. Please excuse me while I go and make predictions for the next book.